This collection of 20/21th century classical/avantgarde music sounded way more cutting edge at its early stages. But these haunting spine-tinglers of otherworldly beauty kept replacing the more challenging ugliness, until the latter material felt like roadblocks on a musical journey. Melancholic and mournful - at times even sentimental and nostalgic-sounding, but then again even mid-century totalitarian brutalist architecture comes across as sort of cozy in 2017. 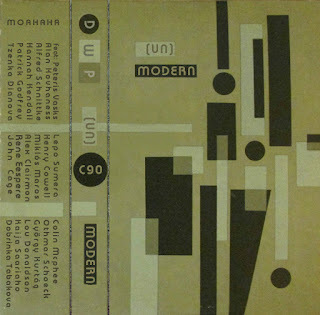 (un)modern or not mind you - for our 50th mix(!) I still compiled a rather dark and brooding hour and a half.